People in Croatia remember my song “Srebrni” (silver) from 20 years ago. it’s about a guy, who I am waiting for to come and say: Srebrni” (silver). I co-wrote it with my brother and as he has written the main part and the refrain, I never really understood it. Well that friend of mine I was in Brighton with me, has mentioned that word “Srebrni” so many times since I know him, that I recently realized that he is “Srebrni” so I call him like that now. I waited for 20 years for “Srebrni” to show up, and now he’s finally here and the adventure can begin. Srebrni is my spiritual partner and cheerleader. We wake each other up at 5 am for meditation for over than a few months now and this was our 3rd big trip together. This time we dared to go to Jou Dispenza’s DreamTime3 advanced follow-up event in Berlin, which is basically a huge slumber party for 800 people. This time we had Renate from Germany with us, whose body also has MS. She called me a month or so ago, crying over the phone saying that she can’t go to the AFU because the hotel is sold out and she can’t go on her own, so I invited her to come and sleep at my brother’s so we can go together. This is how Srebrni got two women with a walking cane to take care of and to carry the stuff off, and I admired his patience and the fact that there are such supermen like him warmed my heart. The teaching began at 4 pm and lasted till 6 pm after what we had a break, dinner and break again till 11 pm when the meditation started. We got super mattresses that blew themselves up as soon we took off the cap and this time we had warm blankets and pillows to make it through the meditation comfortably because Dr. Joe keeps the room at 16-18 degrees Celsius to prevent us from falling asleep when we shouldn’t. The room was enormous so we even had enough space to lie down comfortably. Luxury. The night meditations are great because the Pineal Gland is active since 1-4am when she produces melatonin which regulates the sleep period, menstrual cycle, lowers cortisol, deeply regenerates the body, and so on. 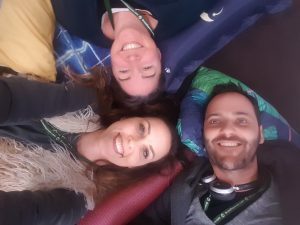 On this workshop, we learned how to help the Pineal Gland to produce upgraded kind of melatonin by amping ourselves up on the elevated emotions like love and gratitude in meditation. Dr. Joe gave us three opportunities to doze off for an hour and a half so when we finished at 7.30 in the morning, I wasn’t tired at all. It was a kind of an aware snoozing next to 800 people lying on the floor with me. Crazy. But when they said we have 15 minutes to get to the nearby park to start our walking meditation, I got scared if I will manage after a night spent half awake on the floor. Remember LouLou the miracle healee from Brighton? She is oxygenmask free and medication free ever since. It was -5 degrees Celsius outside and when a volunteer told me to hurry up because I have a 10-minute walk to the park, I called an Uber and took two lovely ladies from Spain with me. As soon as we got to the park, we put on our headphones and started the meditation and the park was already full of our “zombies” from the workshop. I could do anything. An hour or so later, Srebrni, who always showed up when I needed him (which wasn’t easy on a workshop with 800 attendees), was already waiting for me with a warm taxi to go to breakfast in the hotel plus with the pictures for my blog. I was so happy and proud of myself and grateful because I remembered that in May last year I had trouble standing for more than 10 minutes and now all that bothered me was the cold! I was freezing so much that I almost completely forgot that it was hard for me to walk! After the breakfast in the hotel with the surprisingly good-humored, sleep-deprived people, we went home, took a shower and slept for a couple of hours because he had a lecture at 2 pm, followed by meditation and very special training with 800 kind and happy people. I think that kindness is the currency of the future. We did this for 4 days after what we stayed with my baby brother (he is 10 years younger than me) who lives in Berlin with his lovely wife and we stayed for another two days. One evening while we were having a conversation and sipping wine, he said he prepared him for this conversation because he was aware of his bad reactions in the past which he will try to avoid this time, but he said, he just wanted to tell me he loves me and that he is worried about me. – Bubo, I know that. Your intention has always been Love, and I see it now. So much meditation and psychotherapy, I am a different person! – I started going to a therapy support group for the family members of people who have MS and my therapist would like to see and talk to you once. 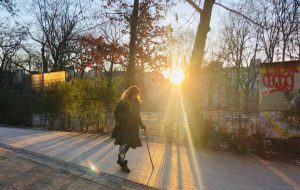 The next day at 3 pm I was in Deutsche MS Gesellschaft talking to Mrs. Niemann who told me that in her career she talked to thousands of MS patients and that my state of mind is very high and that she wasn’t worried at all for me. She promised me to calm down my brother who told her that he needs his older sister. She was appaled by what the doctors had told me and said that it wasn’t surprising that I had such resistance towards the official medical treatments but also encouraged me to reconsider it because in Germany they have 30 different treatments for MS and that she sees no harm in me getting another opinion and make my brother happy with it. I thought: what would Love do? I told Mrs. Niemann that I have a different state of consciousness now than 6 years ago, and that I can see his intention behind his worry and that it is Love. I told her that I want to drive a car again, I want to walk into the sea on the beach and that I want to snowboard again… and she loved my plan and my attitude. I thought: why shouldn’t I let my analytic brother meticulously find me a German neurologist to give me an opinion after a year of intense meditations? It would be interesting to see what’s going on in my brain… Renate texted me this morning that she just received her MRI scans that she does every 2 years and that for the first time in the past 20 years she had no new scars and lesions on her brain and that she is overjoyed. She meditates every day for the past two and a half years. My brother has been so happy that I recognized his love and care that he kept hugging me and kissing me. He is just as ingenious, smart and polite as our father but he is an advanced model so on top of all that he is emotional too and he shows it. Aaaawwww! – Thank you for taking such good care of me. – I’m very happy to take care of you. Thank you for giving me an opportunity to grow with you.